This time last week I was still recovering from the gruelling 100 miles of the Mitie Revolution. The next day I actually felt surprisingly good and didn't really suffer any lingering aches or strains. It was quite a shock to me as I suspected I would at least be walking like the late John Wayne for a few days with saddle soreness! No...nothing. Fellow Bromptonian, David had set up a ride for conquering not only Box Hill but Leith Hill (which has a reputation for being even worse). He had down this weeks ago mainly as his other half Anne secured a place on the Ride 100 which will take in both of these hills as part of its route. This ride was to provide training run for her and a good, demanding day out for those brave enough to sign up. Several people showed some interest in this ride but one by one they fell by the wayside - perhaps partly due to the weather forecast which foretold of heavy rain. David is stoic when offering a ride and with Anne, Milan and myself still committed, the ride went ahead as planned. As soon as my head exited the front door, I could hear and feel heavy, sustained rain. Mrs Orange who had got up to send me off simply commented that I was mad, before pecking a kiss on my check, giving me a hug and retiring to the warmth, comfort and dryness of our house! She was probably right. The journey to Richmond - the start location - was uneventful. When on the overground train, even though I knew my riding Partner Andrew wasn't coming, I could not stop myself to look down the carriages to see if he was there, as has happened so often over the years. I sulked for all of 30 seconds that he wasn't coming out to play before performing a last few checks of my Brompton. We met at Whole Foods in Richmond and Milan was already there. His first club ride, like Anne he too will be doing the Ride 100 later in the year and wanted the chance to pedal up some of the hills his event will contain. Not long after Anne and David rolled in. After a few drinks we set off as it was obvious no one else was going to turn up. As we did the rain had more or less stopped and would not bother us again until about 30 miles into the ride. As per usual, David set a purposeful pace. I have mentioned David's fitness before but it is worth highlighting again. I have ridden behind David for two years and I am slowly coming to the conclusion that he may be a Cylon - part machine. I can just about keep up and I will mention his hill climbing abilities later. We stopped as and when we needed but had a slightly longer stop at Headley before making our accent of the infamous Box Hill. I have tackled Box Hill several times now, mainly in the dark and yes it is demanding and goes on but it isn't really something that holds any fear now. David and Milan set a blistering pace and were off into the distance. I decided to try and ascend at 8 mph and managed to achieve this for the most part. A couple of roadies on a charity event (I think) were overtaken near the summit which felt rather good. The views afforded at Box Hill are stunning and it was strange to we it in daylight for only the second time. Several cyclists took in the views and posed for photographs. We also passed the 'Smith and Western' themed restaurant which for me at least seemed to have lost the mystique it exudes nocturnally. As I passed it I fancied how long it would be before we went on another Richmond to Box Hill and Back and sampled its Americana delights?? As it was raining when I set off this morning, I resisted the temptation of taking one of big cameras. Instead I took my daughters Nikon AW100 (on loan for a fee). If you have read my blog post for last weeks Mitie Revolution you will know that my desire to take photographs - on a 100 mile ride - became farcical. I should have focused on the cycling! Today I was very well behaved and only took a few flitting glanced of countryside. At about the 30 mile point the rain fell and the waterproofs came out. Luckily it didn't last long but the stretch of road we were on was very busy and I didn't particularly enjoy it. Many cars just didn't care we existed. Some even sounded their horns. I was glad to get off it and felt safer as a result. With Box Hill ticked, we made our way to Leith Hill. At the base we posed for a photo before taking waterproofs off and preparing ourselves for the ascent. Leith Hill was much harder than Box Hill that was for sure. David again set a relentless pace and I did my best to follow. The sun had come out in force and steam was rising from the road. More specially I am convinced that I also saw steam emit from David's wheels! Every so often the gradient would ease off, only to be replaced by a steep and sustained incline. Loving the challenge of hills as I do I was enjoying this one and two thirds of the way up I knew I had bested Leith Hill. I would make it to the top without putting a foot down. Seeing David, nonchalantly leaning on his Brompton we had reached the summit. With Milan and Anne moments away we had all done it. Throughout the ride Anne had not been feeling well and I suspect her body was confirming that she had cycled 100 miles last week! I know mine was telling me this! Thankfully, the remainder of the ride to Dorking Station was mainly downhill. We reached the station just after 16:00 and boarded the train to Clapham Common. Once there we went our separate ways we me racing to another platform to get another train which I had to take for a few stops. This was a great little ride. I imagine that in better weather it would be even more special. I was pleased that I beat both hills, especially after last week. It was great to meet Milan and I am sure he will do well when on the Ride 100. He looked very strong on his 3 x speed Brompton. Thanks as always to David for another great ride. I have the NightRider in less that two weeks. This is a 60 mile ride around London which I have been collecting money for the charity, Breast Cancer Care. (Check out my blog for this). So far with gift aid I have raised over £600. I feel confident for this event and more than ready. Last year when I signed up for this ride for the first time I was seriously worried about whether I'd be able to do 60 comfortably. Now, 60 miles doesn't seem scary at all. That is very much down to all the adventures I have taken part in on my Brompton bicycles. 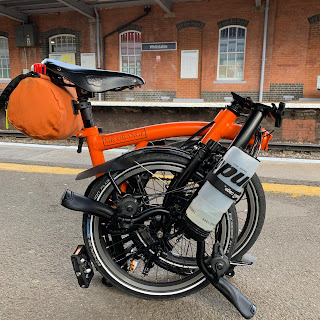 After meeting you and your fellow Bromptonians at the top of Box Hill on Saturday (I was the orange and black P type) I have been inspired to switch to M type bars with some bar ends (probably the Ergon ones) for our LEJOG adventure in the summer. I just wanted to check if you had any issues with the Ergon grips fitting on the M type, also if you would recommend the X-bar or if it's not needed. Hello. It was nice to meet you briefly. I have to disagree. I'd keep the P type as it is. It really is the ultimate tourer Brompton and if I were doing LETGO I'd be doing it on a P type.